Dülken, in the Brüggen district of the duchy of Jülich (coordinates: 51° 15′ 8″ N, 6° 20′ 7″ E), had some Anabaptists in the first half of the 17th century, whose names are listed in the registers of 1638 and 1652. Among them was the father of Jan Floh, who came to Krefeld from Gladbach in 1694. They had been expelled in 1652. State archives of Düsseldorf. Jülich-Berg. II: 252. Niepoth, Wilhelm. 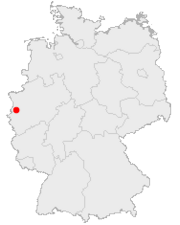 "Dülken (Nordrhein-Westfalen, Germany)." Global Anabaptist Mennonite Encyclopedia Online. 1956. Web. 25 Apr 2019. http://gameo.org/index.php?title=D%C3%BClken_(Nordrhein-Westfalen,_Germany)&oldid=118130. Niepoth, Wilhelm. (1956). Dülken (Nordrhein-Westfalen, Germany). Global Anabaptist Mennonite Encyclopedia Online. Retrieved 25 April 2019, from http://gameo.org/index.php?title=D%C3%BClken_(Nordrhein-Westfalen,_Germany)&oldid=118130. This page was last modified on 12 April 2014, at 03:07.